A very curious map of central Africa dating to approximately 1730 by Henry H. Toms. It covers the mid-section of Africa roughly from the Gulf of Guinea and the Atlantic eastward to the Red Sea and the horn. Extends southward as far as modern day Tanzania. The map is full of curious and often spurious information. 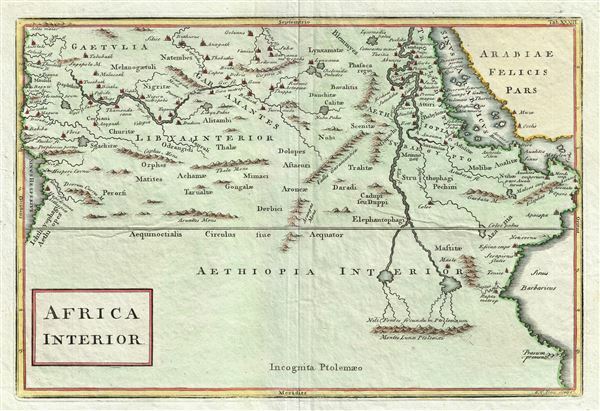 The Kingdoms of the Axuxmites in modern day Ethiopia, as well as the Nubians, the Amanites, and many other mysterious peoples are identified. In the west, the Niger River begins and ends without a source or oceanic outlet. Further east, the map follows the course of the Nile river southward, past the lands of the Elephantophagi, to two mysterious lakes. These great lakes, at the foot of the mountains of the moon, were part of a long enduring myth in African cartography that dates to the works of Claudius Ptolemy. In fact, though issued nearly 1600 years after Ptolemy's death, most of the information here is based directly on his work. Cartographically this map is very similar to Culver's map of the same name issued in 1736. Henry William Toms (1701 - 1765) was an English engraver, print seller, publisher and stationer active in London during the early to middle 18h century. The son of Peter Toms, Henry apprenticed under John Harris from 1716. He was engraving independently from at least 1726 and his imprint appears on portraits, books plates, landscapes, maps and architectural prints. His name appears on the great Popple map of North America as well as on important maps by Lempriere, Seale, Boulton, Moll, and others. He was imprisoned for debt in 1761. His son, Peter Toms II (1726 - 1777) became a well known painter. His apprentices included the engraver and publisher John Boydell (January, 19 1720 - December 12, 1804). He lived on Masham Street, London. Very good. Original platemark visible. Original centerfold. Blank on verso.